Grademiners.com presents itself as the most reliable and affordable custom writing service for everyone. Yes, at first glance it has the bright-looking website, which shows its good reputation on the market, but is it really true? Are their papers of really high quality? If you want to know all this information in order to make the right decision, keep reading and you’ll find out everything. You are welcome by the website, design of which is really good-looking and it is fully of persuasive information about the most requested papers among the students. But despite the many pages, there are not a detailed list about their services. Most of their information focuses on essays, but they also write term papers, dissertation, theses etc. It will be more convenient and less time-consuming when there will be provided the full list of academic papers. The customers should know what they can order from company and get to know what features are included without spending a lot of time on search. Pricing on Grademiners.com depends on number of pages, paper type and student level. 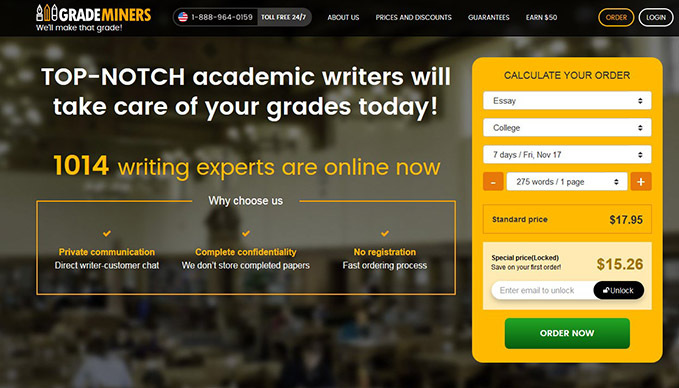 We are not sure that this writing service is affordable for everyone, because prices are very inflated here. There are other paper writing companies with considerably lower prices. On this website the first - time client is able to get the discount of 15%, but there is no confirmation that this discount is valid for each subsequent order or it is just a temporary special offer. In order to make sure that the content of the papers is really high-quality and 100% unique, we ordered an essay with a deadline of several days. Despite the fact that the price was high, we get our order out of time, and of course it didn’t meet our expectations. An assignment was creative and unique, but it wasn’t well-checked and it seemed to us that content was very basic for the undergraduate level paper. Maybe for student from college it would be the great opportunity to get a high grade, but not for undergraduates. Grademiners.com offers round the clock care and support. But sometimes it takes a lot of time to contact with them. The service has a live chat, a phone number and an email where you can reach them. However, the customer needs to wait near 10 minutes in order to be served on the live chat, after he/she has to wait for some extra minutes to receive the responses from the representatives. It is very time-consuming, so the customer support service should be more improved. So, we are not sure that Grademiners.com is really suitable service for those who want to be succeed in their academic career. There are still enough gaps that should be taken into account and refined. The prices are high and don’t fit the quality of the content. We recommend you to find another company, where all promises will be kept and the end result will meet your expectations.